My feelings about the films of Rainer Werner Fassbinder are somewhat ambivalent. By the time I saw my first Fassbinder film in 1981, he only had four more features to come before his premature death. That first encounter, however, was with his third feature – Götter der Pest (Gods of the Plague, 1970) – and at the time I didn’t really know what to make of it. Drawing from his own radical theatre work and at least partially influenced by the Nouvelle Vague, it was a harsh, artificial work which made use of and critiqued the gangster genre. My subsequent experience of Fassbinder’s work was scattered and non-linear – I didn’t have the opportunity to follow his development as it it happened, but rather moved back and forth through the oeuvre. This made for a chaotic impression, although in retrospect there is a discernible arc to his career – the early films grew out of his work with the Anti-Theatre in Munich in which he was the creative driving force, and from which he drew many key figures for the stock company of actors who provide a kind of unity and continuity through his film and television work. Fassbinder was incredibly prolific. In a career which remarkably lasted only fifteen years, he made more than forty features and television productions, acting in quite a few of his own films as well as those of others. He also continued his theatre work with a couple of dozen plays. As impressive (and intimidating) as this prodigious body of work is, the speed with which he worked, particularly in the later large-scale productions, has fed my ambivalence. I often get the impression that at some point, roughly half way through a film, the filmmaker has already begun to lose interest as his attention moves on to the next project. In films like The Marriage of Maria Braun (1979), Lili Marleen, Lola (both 1981) and Veronika Voss (1982), the first half seems more fully formed than the second as if he has begun to rush to get it over with. But despite my feelings about individual works, Fassbinder remains a fascinating figure whose larger body of work offers fertile ground for critical exploration. These films dissect the fraught history of post-war Germany, the evasions and compromises used by the bourgeoisie to move on from the horrors in which they were unavoidably implicated. In Fassbinder’s cinematic world guilt and excuses distort personalities and taint the economic resurgence of Germany as it ascends again to political and social dominance in a unified Europe. 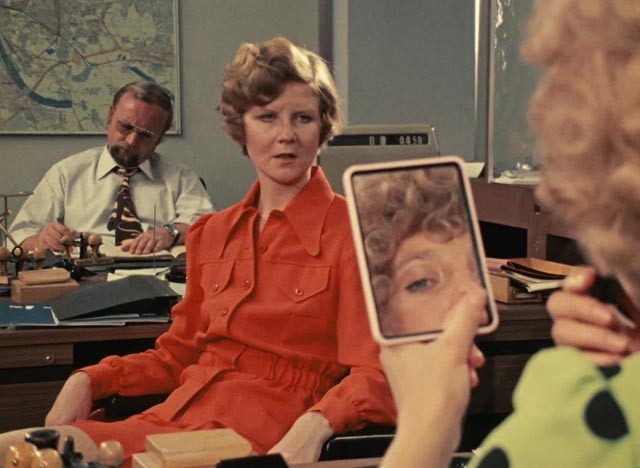 Reflecting Fassbinder’s own prodigious personality (on- and off-screen he was a larger-than-life character), his films are often messy and complicated even as they become more stylistically assured and even elegant. He was attacked by the right and the left, accused of misogyny even as he placed strong female characters at the centre of so many narratives, accused of homophobia despite his own overt bisexuality. His work makes no effort to reflect particular established ideological positions and thus despite the often political subjects they depict life in all its uncomfortable contradictions. From this, there emerges an impression of sourness, even cynicism – Fassbinder doesn’t seem to have much faith in a human capacity for goodness and decency. Which is why his five-part television series from 1972-73, Eight Hours Don’t Make a Day, seems like a startling departure, almost a revelation. Commissioned by broadcaster Westdeutscher Rundfunk to create a dramatic series depicting contemporary working class life, Fassbinder (himself a product of the middle class) produced a richly layered melodrama about the experiences at home, at work and out in the larger social world of four generations of the Epp family. This project came on the heels of a major shift in the director’s work which was inspired by his encounter with Douglas Sirk (both the man himself and his Hollywood work in the 1950s); Fassbinder was awakened to the possibilities provided by melodrama as a vehicle for exploring social and political concerns in a stylized form which freed him from both the strictures of realism and the alienating effects of his theatre work. Eight Hours Don’t Make a Day provides room for humour, drama, romance, anger and happiness, all woven together to produce a vigorous sense of contemporary life. It was originally conceived in eight feature-length parts, but WDR cancelled it after the completion of the first five. 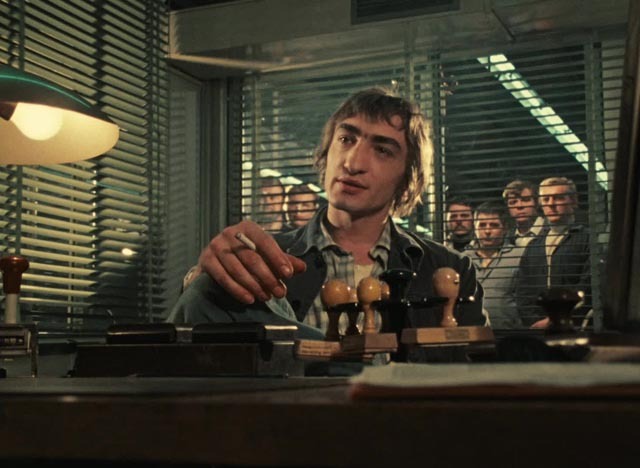 This inadvertently resulted in an extended work which stands apart from so much of Fassbinder’s other work in that it remains unexpectedly upbeat. While he had planned to reach much darker conclusions by the end of the eighth episode, as it now stands it ends on a note of warmth and hope which is almost utopian. The central character is Jochan Epp (an immensely engaging Gottfried John), a factory worker whose ambitions don’t point towards escape from a working class existence, but rather a greater sense of freedom within that existence. Early in the narrative he devises a way of improving production in the machine shop where he works, only to find that this improvement (which enables the company to meet a deadline which was previously at risk) is used by the bosses as a justification to deny the workers a promised bonus. While this creates conflicts within the shop floor team, it eventually spurs them to action which gives them more power over the work they do – paradoxically, the bosses accept the workers’ assumption of control because this empowerment makes them more productive, which is good for profits. This theme runs through the five episodes, pointing to the inherent contradictions in the capitalist construction of labour and management – and no doubt this is the aspect of the series which would eventually have grown darker, but as it stands we are left with that image of workers given control over their own labour, providing a sense of personal satisfaction regardless of the larger matter of exploitation by the bosses. Beyond Jochen’s experiences at work, much of the series deals with his personal and family life. In the first episode he meets Marion (a radiant Hanna Schygulla) and their developing romance provides the other central thread, a strong emotional attachment complicated by social and economic factors which produce tensions which come close to derailing the relationship. 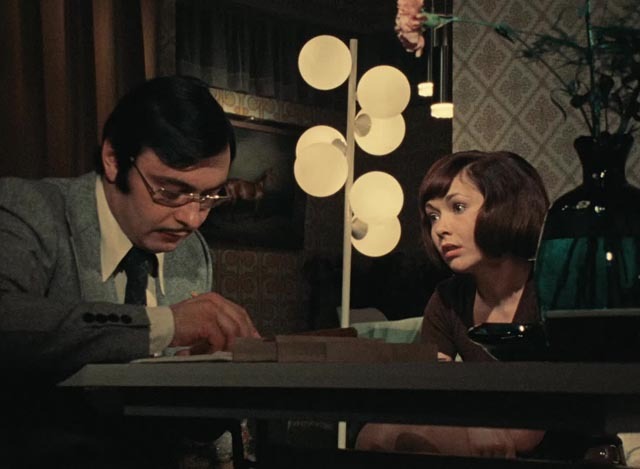 Within the context of a story which combines melodrama and romantic comedy in equal measures, John and Schygulla give warm and naturalistic performances which disguise the stylization of Fassbinder’s script, something the director no doubt learned from Sirk. Woven around Jochen and Marion’s story are a number of other threads which illuminate the possible courses their lives together might take. Jochen’s parents are a couple who have settled into a comfortable pattern of daily irritations – his cranky father Wolf (Wolfried Lier), who is only happy when he’s complaining about something, and his patiently indulgent mother Käthe (Anita Bucher). In contrast, Käthe’s mother, Jochen’s grandmother, known only as Grandma (Luise Ullrich), is a force of nature, a woman of boundless energy and goodwill, determined to shape the world around her to her own will. She finds a perfect companion in Gregor (Werner Finck), a widower willing to go along with whatever plan she throws at him – particularly, her desire to create a space for the neighbourhood kids who have nowhere to go and play dangerously in the street. She appropriates an empty building and sets up a daycare – an act which gets her and Gregor arrested for trespassing on city property, but she wins in the end by making use of the media to intimidate a hostile bureaucrat into legitimizing the daycare. 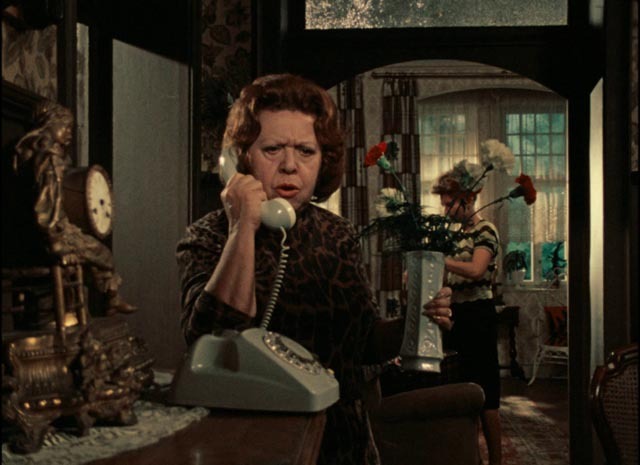 Meanwhile, Marion has to deal with Irmgard (Irm Hermann), her co-worker in a newspaper advertising department, and her own mother, both of whom are displeased with her choice of a mere worker as a romantic partner. Jochen’s sister Monika (Renate Roland) tries to break free of an unhappy marriage to Harald (Kurt Raab), a relentlessly controlling man who believes that there’s no room for personal happiness in life, that existence is a chore to be endured. The series was attacked by the left for its unrealistic depiction of the working class and its failure to provide a correct political critique of capitalism … all of which may well be true, but it’s a melodramatic narrative whose theme is the need for individuals to take what control they can of their own lives within the existing system which shapes society. It doesn’t justify capitalism, but acknowledges that this is where things are at this time and seeks for ways in which the worst effects of such a social system can be mitigated by personal action. Its “utopianism” resides in the idea that individuals caught in this system can nonetheless take action which may result in personal happiness. Despite the final three episodes having been left unfilmed, it feels complete. 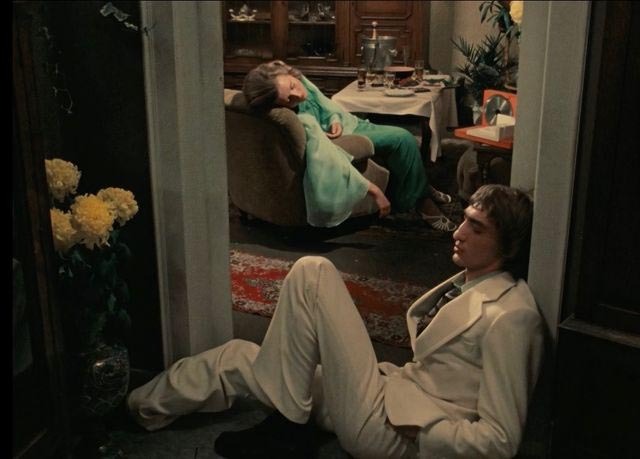 Eight Hours Don’t Make a Day is the sunniest and most charming work of Fassbinder’s career, the episodic form and length (495 minutes) providing room for the characters and the themes to breathe in emotionally satisfying ways. Shot on 16mm film, the production doesn’t look rushed, despite the limitations of time and budget. As in his other television work – World on a Wire (made on the heels of this series in 1973) and the more ambitious Berlin Alexanderplatz (1980) – Fassbinder uses an energetic and very cinematic technique. The camera is frequently moving in elaborately choreographed extended takes which make dynamic use of interior and exterior space; in counterpoint, other shots are composed in dramatic tableaux which visually express the psychological and emotional undercurrents of a scene. Even working on television on a commissioned project, Fassbinder remained fully committed as an artist. Criterion’s two-disk Blu-ray is mastered from a 2K restoration from original 16mm film elements. It has a rich, grainy film look (similar to Fassbinder’s other television work – World on a Wire, Berlin Alexanderplatz). It’s a colourful image, with a lot of detail and decent contrast. 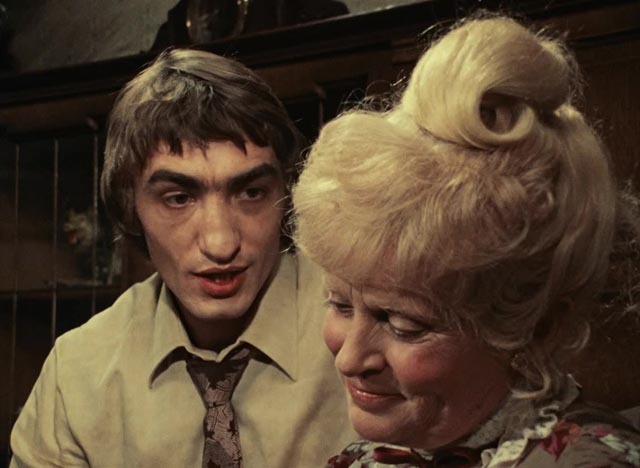 There are two supplements: an interview with film scholar Jane Shattuc (19:30), who discusses the series’ position in Fassbinder’s work, his own middle class origins and their effect on his empathy for the working class characters. “Eight Hours Don’t Make a Day”: A Series Becomes a Family Reunion (42:01) is a retrospective documentary by Julianne Lorenz, which includes interviews with actors Hanna Schygulla, Irm Hermann, Wolfgang Schenk and Hans Hirschmüller. This provides an account of the series’ origins, its mixed reception when it first aired, and a discussion of its political “failings”. The booklet essay is by film and media scholar Moira Weigel. This entry was posted in Review and tagged Blu-Ray, Criterion, Directors, German film, Melodrama. Bookmark the permalink.